Here we are at the end of 2013 and I’m finally writing a new blog post and with today marking the final moment(s) of the Eleventh Doctor (Matt Smith), during the episode “The Time of the Doctor” airing tonight at 9PM EST, I thought it would be a good time to go through my favourite moments of Matt Smith (The Eleventh Doctor). So let’s jump right in, Geronimo! Okay so this may *just* be in the realm of being categorized as an “Eleventh” moment, so I will count it as one. Right from the first moments we lay eyes (and ears) on this Doctor, we know that he’s going go places the Doctor has never gone. I could list countless scenes from that episode “The Eleventh Hour” but I will limit myself to just this one. While the thought of Custard repulses me, I do love some good Fish Fingers. Matt Smith really shines during this scene rejecting all kinds of food, even bacon (Right on! Bacon is poison! ), until finally deciding upon a combination of Fish Fingers and Custard. I thought the part with him throwing a plate of toast out the door and yelling “and stay out” was hilarious. 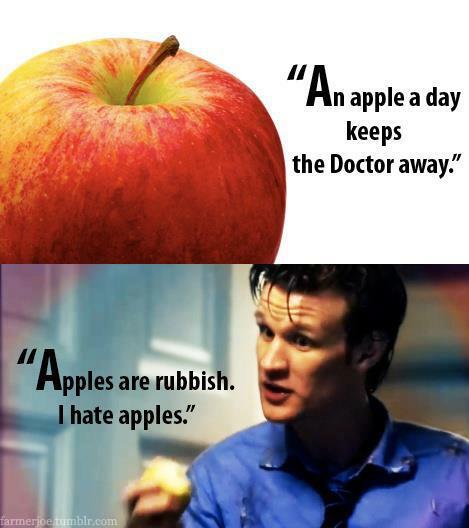 Let’s also not forget what he said about apples. This is more of an Amelia Pond moment but all the same it is still a moment during the Eleventh’s time. I couldn’t help but love this scene, from the Doctor’s speech about being “Alive” to Amy talking about fancying someone. Another one of the Eleventh’s brilliant moments, with the Weeping Angels surrounding them and no way but up to go. The Doctor says “There’s one thing you never ever put in a trap – me.” and shoots the gravity globe and they all jump at the same time, suddenly they are on the ceiling. I thought it was hilarious watching the Doctor just observe their conversation while just standing there in plain sight behind them and then they turn around and the Doctor just motions for them to continue. Then while he’s sitting in the desk he makes all sorts of random demends (this was the bit I loved the most from this scene), fez included. All the bickering between the TARDIS and the Doctor was just so fantastic. The bit where the TARDIS says “Yes but I always took you where you needed to go” revealed a great realization that the Doctor may not be entirely in control of the TARDIS. There are many more great lines from this scene but it’s best if you just watch and listen to them yourself. Having the two Doctors finish each others sentences was a great thing to do, having the Doctor say “It’s just so inspiring to hear me say it” was just topping on the cake. Also the bit when Doctor says “Yowza” and the other Doctor (as if he’s questioning himself) asks “do we tend to say ‘Yowza’?”. The Eleventh Doctor can be quite impatient sometimes (or that’s a timelord thing) and this scene shows just how much he dislikes staying somewhere for an extended period. After watching this episode we see that the Doctor has destination after all and that he isn’t just “wandering about”. All the Doctors in this scene make for one awesome pan out. Well that’s about it for now. I will probably add to this after watching “The Time of the Doctor”. Thanks for reading and Merry Christmas (yes I said it and I don’t care)!